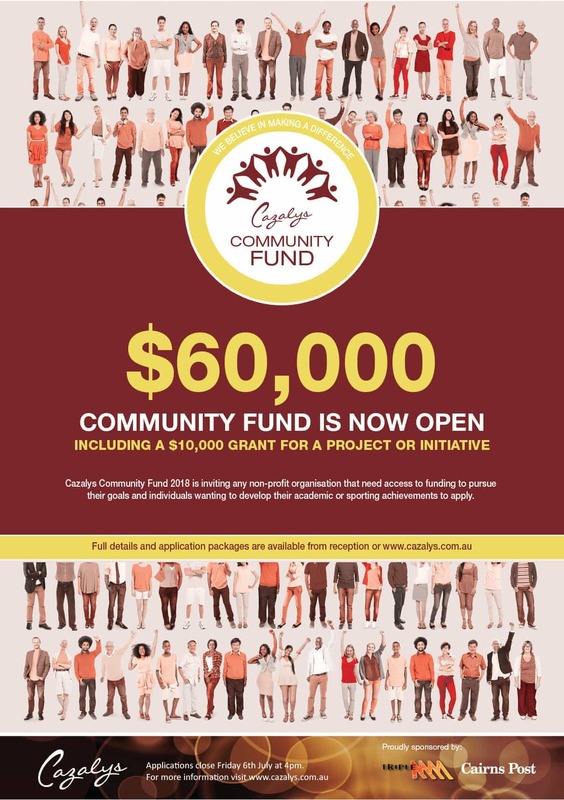 Cazalys Community Fund 2018 is now open to any not – for profit organisation or Individuals that provide support to people in the Cairns Region or need access to funding to pursue their goals. Each year the Fund donates sums of up to $5,000 to organisations, $1,000 to individuals PLUS a one off grant of $10,000 for an organisation major project. This year again we are including a one off grant for $10,000 to the organisation that has a larger project or initiative that represents the core values and general wellbeing of the community at large. Entering is easy – Applications packs will be available from Cazalys Cairns reception and online through the Cazalys Cairns website at http://www.cazalys.com.au/community-news/ from 1st May 2018. Closing date for all applications is 4pm Friday the 6th July.